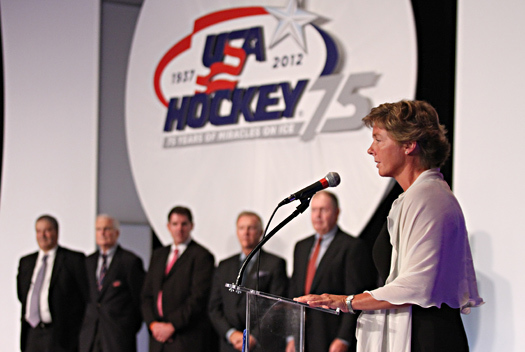 One by one the icons of the American coaching fraternity filed onto the stage as part of USA Hockey’s 75th anniversary gala. First came Murray Williamson, head coach of the 1968 and 1972 U.S. Olympic Teams, followed by Lou Vairo (1984), Tim Taylor (1994), Ben Smith (1998, 2002 and 2006 U.S. Women’s Teams) Peter Laviolette (2006), Mark Johnson (2010 Women’s Team) and Ron Wilson (1998 and 2010). And finally, after suitable applause, the past was introduced to the future as Katey Stone was introduced as the head coach of the 2014 U.S. Women’s Olympic Team. The move marked the first time that a woman would be at the helm to lead a U.S. hockey team into Olympic competition. Long after the evening ended, the significance of crashing the old boys’ club was not lost on the 46-year-old native of Watertown, Conn.
“When I got up on the stage in front of that distinguished group of former Olympic coaches, there aren’t any words to describe that. It was amazing. And just to be a part of that group and to be a part of USA Hockey for so many years is awesome,” Stone said. Good things have certainly come Stone’s way over the course of her 18-year collegiate coaching career. She is the winningest coach in the history of women’s hockey at Harvard University and one of the most successful coaches ever in the women’s game. She has racked up 378 victories and a national championship in addition to numerous league and conference titles. 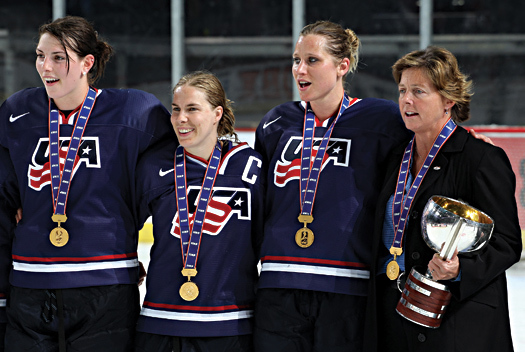 After celebrating a victory at the 2011 IIHF Women's World Championship, Katey Stone will look to bring home the gold when she leads the U.S. Women's Olympic Team at the 2014 Sochi Olympic Winter Games. It’s on the international arena where Stone has added to her already impressive coaching resume. Over the past six years, she has led numerous U.S. teams, including U.S. Women’s National Teams that won gold at the 2011 IIHF Women’s World Championship, and silver at the most recent tournament in Burlington, Vt. She was also behind the bench to lead the U.S. to the gold medal at the first-ever IIHF World Women’s U18 Championship in 2008. “There’s no question that I certainly never expected this, it wasn’t what I was planning for. I was just trying to be good every day,” said Stone, who will take a leave of absence from her position at Harvard until after the Games. Stone will now have approximately 19 months to put the team together that will look to win its first gold medal since 1998. As the talent pool in women’s hockey continues to grow deeper by the day, she knows there will be difficult decisions ahead, but she is confident she will board the plane for Sochi with the right 23 players that give the U.S. the best chance to bring home gold. And if that happens, Stone will join an even more exclusive coaching club, along with Jack Riley, Herb Brooks and Ben Smith, as U.S. coaches who have won Olympic gold.